As 2018 draws to a close, we welcome the final Hearthstone expansion of the year. 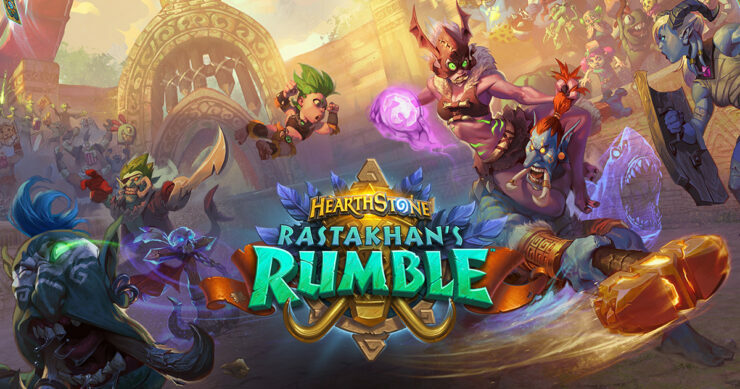 Rastakhan’s Rumble is scheduled to release on December 4th and, in keeping with previous expansions, we have a new keyword to familiarise ourselves with. Overkill is an ability that activates when a card deals enough damage to eliminate an enemy character. Overkill cards can have a variety of different abilities, including armour gain, card draw, summoning minions and more. It’s also important to note that Overkill effects will trigger regardless of whether the attacking minion survives or not. Usually, the last expansion of the year includes a higher power level of cards compared to the previous expansions during that year, and Rastakhan’s Rumble appears to be no exception. With this strong new keyword and a number of deck archetypes that have fallen out of the current meta now experiencing a bit of a revival, this set should see a shift in the competitive decks we’ll be seeing on the ladder in coming weeks. That said, we may also see some of the stronger current decks gaining more powerful tools. As for the most exciting cards in each class, we’ve selected our favourites below. Remember when Ragnaros the Firelord, the staple card that was included in the majority of Hearthstone decks for a number of years, was banished to the Hall of Fame? Well, he’s back, but for Mages only. 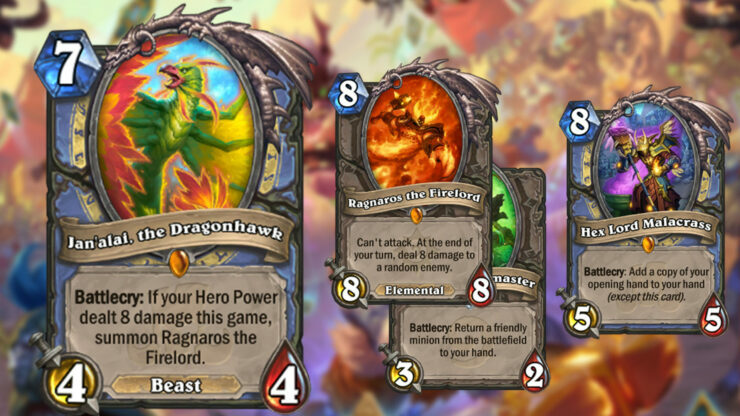 Jan’alai, the Dragonhawk will operate similarly to a quest, (although you won’t have to activate it in advance, turn one), all you have to do is deal eight damage using your hero power. Seeing as this new card costs seven mana, this slots perfectly into the already powerful Odd Mage, which also conveniently upgrades your hero power to do two damage – making it even easier to summon Ragnaros. In addition, Ragnaros is an elemental, meaning that he’ll gain Lifesteal capabilities if you play Frost Lich Jaina when he’s on the board. If you’re not keen on running an Odd deck and you’re lucky enough to find Jan’alai in your opening hand, you can also include the new Hex Lord Malacrass card. This will enable you to add a copy of Jan’alai to your hand, meaning that you’ll be able to summon Ragnaros a second time. A cheaper way to achieve this would also be to include the Youthful Brewmaster card, playing Jan’alai, the Dragonhawk first and then returning it to your hand for nine mana. Discarding cards can often result in you throwing away something valuable, potentially costing you the game, however, Shriek aims to avoid these situations. At just one mana, this card enables you to discard your lowest card, meaning that you can essentially force it to discard something you’re not too concerned about (as long as you don’t draw it first). For example, you wouldn’t be too fussed about throwing away a Fire Fly to activate a powerful card like this. At such a low cost, Shriek is a good way to stall against aggro decks, potentially clearing a board that would have otherwise spiralled out of control. With Defile rotating out of Standard play in April 2019, we could potentially see this taking its place. At zero mana, there’s a lot of options to consider with Regenerate. Restoring three health for nothing can be valuable in sticky situations but looking beyond that, there are a number of cards that this will synergise well with. Taking another new Priest card, Auchenai Phantasm, into account, Priests will once again be able to turn their healing effects into damage – albeit for one turn only. Three damage seems pretty decent for just two mana, beating the existing card, Holy Smite, as you also get a 3/2 minion on the board. Regenerate will also make a nice addition if you happen to run Lyra the Sunshard as it’ll enable you to add another random Priest spell to your hand for free. 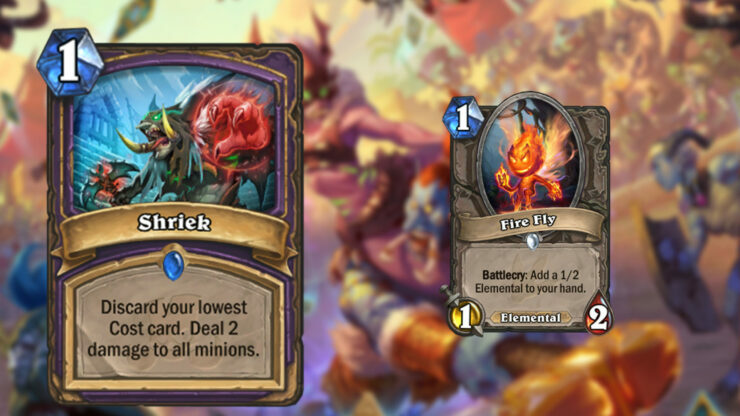 Of course, these cards can also be played on the same turn as Prophet Velen, doubling the healing or damaging effect. Remember, cards that increase your spell damage will also synergise with Auchenai Phantasm/Auchenai Soulpriest and Regenerate. 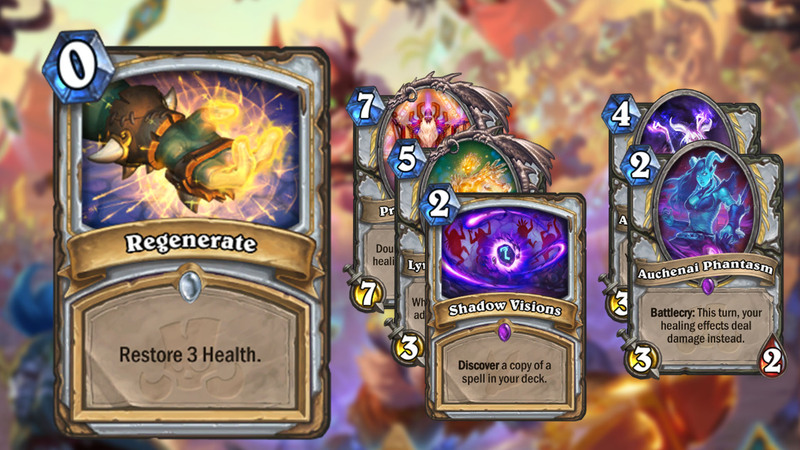 For example, if you run Zerek’s Cloning Gallery and manage to summon both Prophet Velen and Malygos in addition to Auchenai Soulpriest, each Regenerate card you play will do 16 damage. Shadow Visions will also enable you to add copies of this card to your hand. Continuing the trend this year to release one new Hero card per expansion, Blizzard has bestowed the Hero card to the Hunter class. Zul’jin’s powerful Battlecry is reminiscent of a certain old God, however, this effect is almost always going to result in the person who cast it being ahead on board. Zul’jin slots into most Hunter decks without having to create brand new archetypes, though you will have to remove any direct removal spells like Beast Command to avoid hitting your minions and/or face. If you run Zul’jun alongside the secret package (a bunch of secrets plus the spellstone), you should find yourself coming away with a board filled with 3/3 wolves in addition to every secret you played during the game. 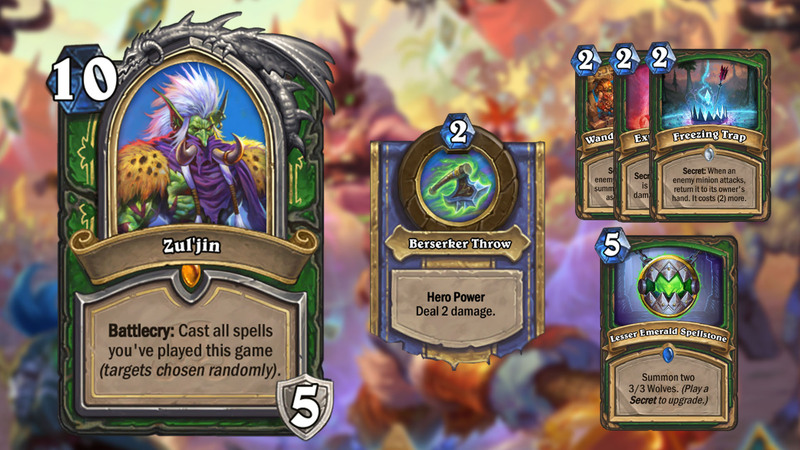 Playing Zul’jin will buff your hero power, allowing you to target minions. Try to play this card before dropping Deathstalker Rexxar as his Build-A-Beast power is much stronger overall. 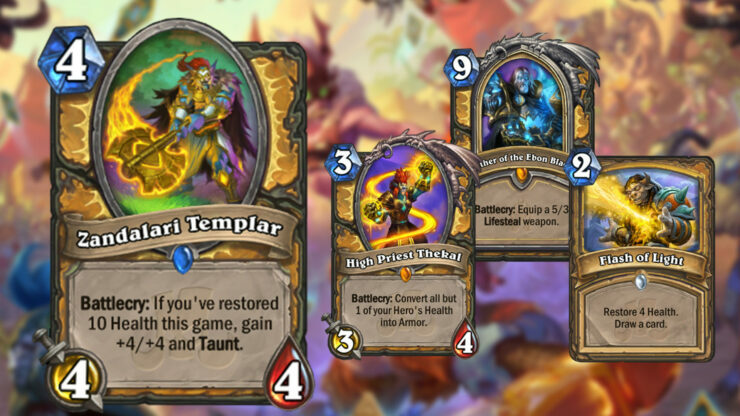 Prior to Rastakhan’s Rumble, the trouble with Control Paladin was its inability to take enough damage in order to heal back up to thirty. With the reveal of High Priest Thekal and Bloodclaw, being able to restore health your health in the early game should no longer be an issue. Paladin now has its own version of Warlock’s Hooked Reaver, albeit with a condition that this new archetype of Paladin should be able to hit without any issues. Rastakhan’s Rumble has also introduced Flash of Light, an excellent healing spell that will work perfectly alongside self-damaging cards like Crystallizer. With cards like Uther of the Ebon Blade and Crystalsmith Kangor, Heal Paladin is finally receiving the support it needs to make this archetype viable. Rush Warrior is an archetype that currently exists, though its power seems a little too balanced to be considered truly competitive. 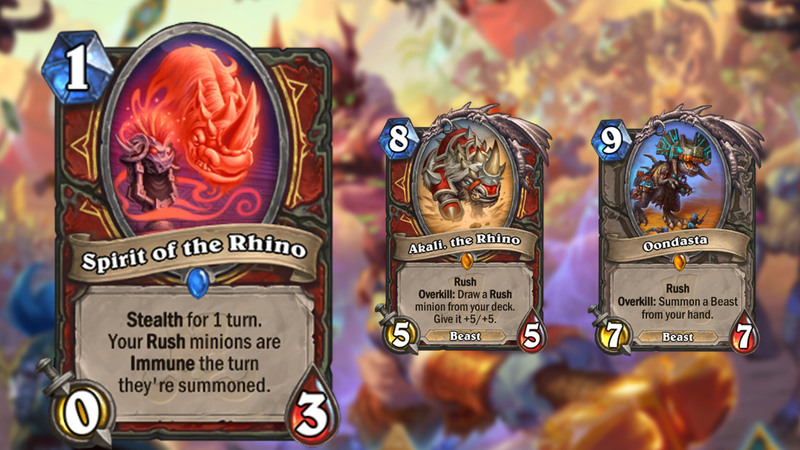 Spirit of the Rhino may not do enough to patch up the weaknesses Rush Warrior has against control decks, though it’ll make games against aggressive decks that much easier. For such a low cost, Spirit of the Rhino gives players the chance to play practically any Rush minion. Combined with high-cost cards like the brand new Oondasta and Akali, the Rhino, the amount of value you can potentially generate in a single turn should be devastating. 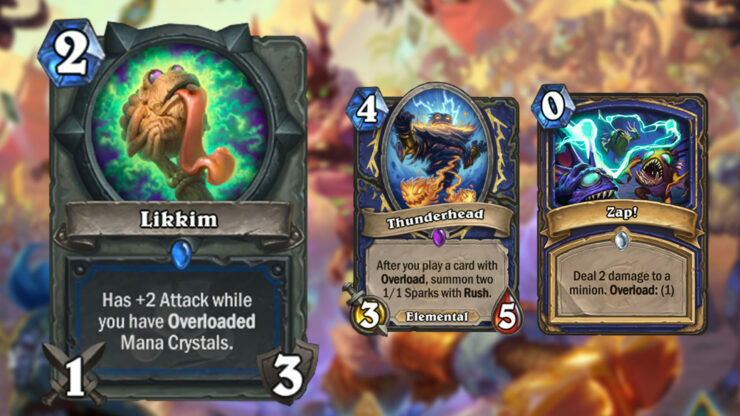 Serving as a callback to Midrange Shaman’s heyday where Spirit Claws proved to be too strong to avoid a crippling nerf, Likkim will be a strong addition to Even Shaman decks going forward. If you’re able to Overload your mana crystals (which shouldn’t be too difficult), you’ll be able to ensure that this weapon has 3 attack for at least two turns as the effect works in both the turn that you Overload and the turn afterwards, where your mana crystals are locked. This card will also make existing cards such as Thunderhead and Zap! even more viable in Even decks and may sway players to embrace Overload more seriously once again. 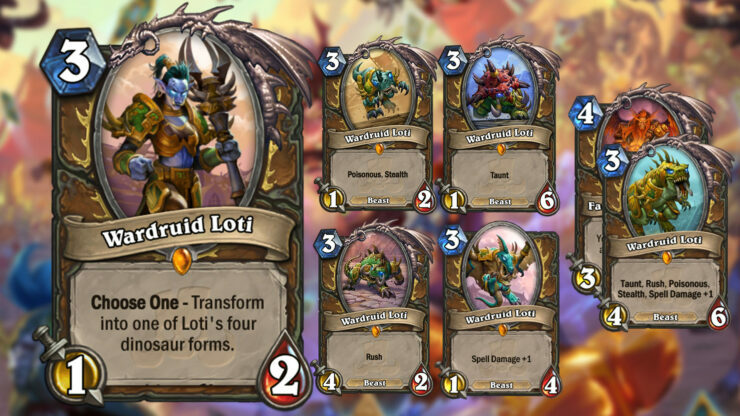 We’re hopeful that the inclusion of Wardruid Loti in Rastakhan’s Rumble should see a bit of variety in Druid decks from now on. While this won’t be a good fit for decks that run Oaken Summons, such as Taunt Druid, decks that incorporate Flobbidinous Floop, will be able to reap the benefits of transforming into one of the four dinosaur forms a second time. We imagine this card will also see more play in the future when the other expansions rotate out of Standard play. Currently, the closest card to this in existence is Druid of the Scythe, which forces players to choose between a 4/2 minion with Rush or a 2/4 minion with Taunt. Wardruid Loti is therefore far more versatile, giving players more options to choose from for the same amount of mana. Overall, it’s nice to see a balanced Druid card that also has a number of options to fit your game plan in the early game. If you prefer to play Wild, pairing this with Fandral Staghelm will create a beefy 4/6 beast with all of the above effects, costing seven mana altogether. Though the rest of the cards Rogue received in this expansion may not be particularly interesting, the Spirit of the Shark looks like it will be adding some much-needed firepower to the class. 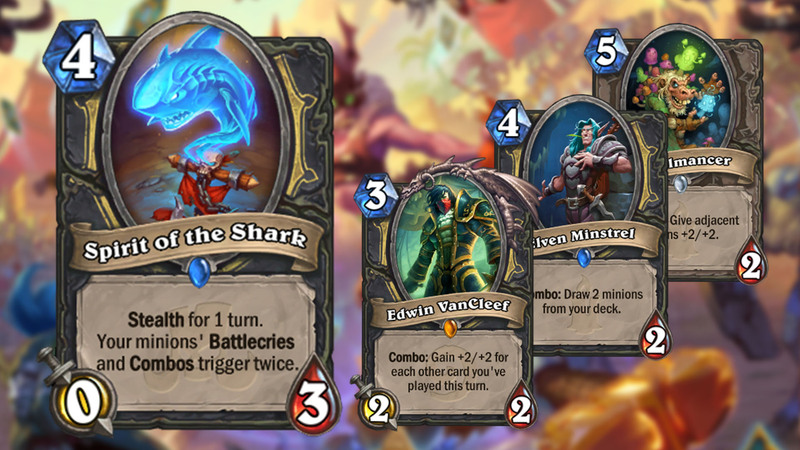 Unlike Brann Bronzebeard back in the League of Explorers set, Spirit of the Shark doesn’t have the stats to contest the board. Fortunately, Spirit of the Shark does have Stealth for a turn, allowing you to set up some game-winning combos providing it doesn’t get removed immediately. Turn four Spirit of the Shark, turn five Fungalmancer/Elven Minstrel seems awfully strong to me. At worst, if you couldn’t manage to use this card early on, you are able to run two of these Spirits, giving you the option for late game shenanigans. If you thought 8/8 Edwin Vancleefs were good, Spirit of the Shark is going to blow your mind. 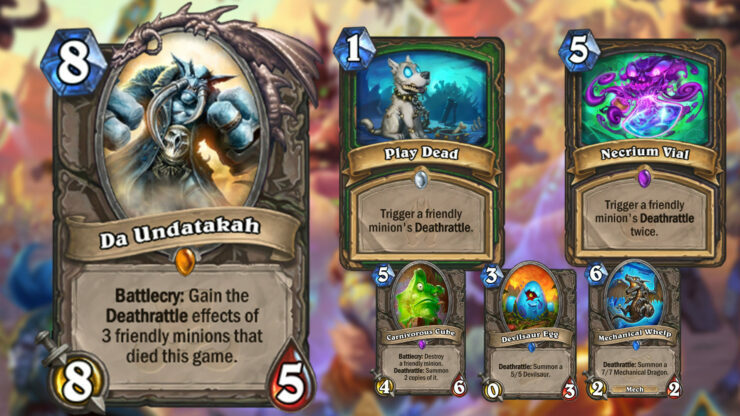 Da Undatakah looks to be the most powerful card in the entire expansion thanks to its obscene Battlecry effect. A card like this isn’t great for every class in the game, however, the classes that can activate Da Undatakah’s Deathrattle right away will be creating decks specifically to harness this powerful card. At only eight mana, there’s plenty of room for classes to find cards that work well alongside Da Undatakah. The most obvious home for this card will be in Deathrattle Hunter and Rogue who can trigger Deathrattles using spells (Play Dead and Necrium Vial + Prep). There’s also space for this card in Taunt Druid, allowing you to create potentially infinite copies of Hadronox + Astral Tiger. Don’t be surprised if this is the first card that sees a nerf from the Rastakhan expansion. That wraps up our most anticipated cards ahead of Rastakhan’s Rumble’s release. Log-in when Rastakhan’s Rumble releases to claim six Rastakhan’s Rumble packs, a free Legendary Loa card, and two copies of the rare Spirit associated with it. Which cards are you most looking forward to? Let us know in the comments section below!